BRITISH IRONWORKS: Bits and pieces sorted. Got a fair bit sorted out today, away from the bike but still pushing forward. The front mudguard has turned up, it's the matching early Triumph ribbed style to match the back, made in Birmingham, good clean new steel and a good price. Almost a shame to cut it up and bin half of it, but hey-ho ya gotta suffer for your art. A mate at work knocked up the threaded spacers to finally fix the rear mudguard brackets to the frame. Had them threaded 3/8" BSF, one of my pet hates is to have to use two or three different sets of spanners on one bike. Popped 'round the corner from work and checked out a local sheet metal place, the guy who owns it seems pretty cool and owns a laser cutter. It seems to be that forty quid is the minimum fee and he'll knock out an hours worth of bits for that. All the same bits that is, and from a drawing that is supplied in a DXF format. I can foresee a bit of thought going into what can be created, the first job will be some more of the brackets used on the rear mudguard, kinda like a signature piece. Phoned up the guy who is making me a pressed aluminium number plate, reckons he made it last week but was not happy with it so he scrapped it and will redo it today. Time will tell on that one, I like to believe people so I'll give him the benefit of the doubt. 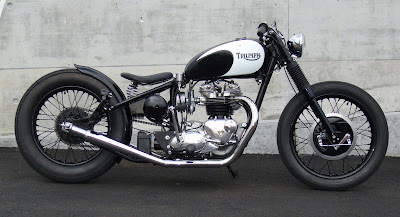 I'd like to share this with you all, this drop dead gorgeous Triumph was built by Freddy in Switzerland, truly a ting of beauty in my humble opinion. A great mix of classic lines, retro paint and great engineering, inspirational work indeed.